The Cotswold town of Cricklade is clearly in love with its history. Signage announces its 9th Century, Saxon origins. On the high street, a squat cottage was once a highwayman’s hideout. Another building trumpets its Tudor construction. But while Cricklade might have a foot in the past, one of its pubs - The Red Lion - is relishing its role in beer’s modern renaissance. 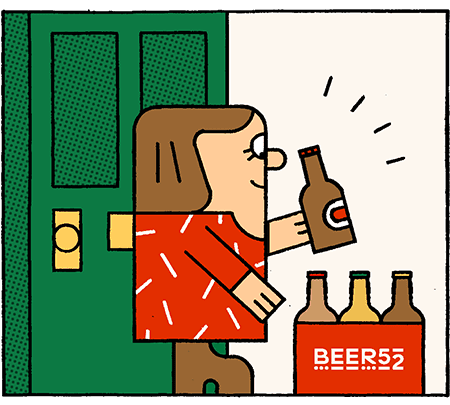 It’s here, after the setting autumn sun has drenched the town’s Bath stone buildings in a warm ochre glow, that Wiltshire’s Beer52 faithful meet for our latest bottle share. The Red Lion has the cosy vibe of a traditional boozer, with antique bric-a-brac on the walls and no less than ten cask hand-pulls on the bar. Those trad offerings are complemented with four craft-focused rotating keg lines, plus a well-stocked fridge of bottles and cans from the likes of Cloudwater, Siren, Founders and Magic Rock. Five of those cask lines serve brews from the Red Lion’s own four-barrel brewery, Hop Kettle, while its 10-barrel sister site in nearby Swindon serves the rest of the county and beyond. When I catch up with Hop Kettle’s Cricklade brewer, Matthew George, at 6.30 on a Friday evening, the pub is already rammed. It’s two-deep at the bar, there’s a meat raffle doing the rounds, and locals are enviously eyeing the huge corner table set aside for us - the only free seats in the house. An hour later, our guests are gathered around it, and Matthew kicks off the tasting with Hop Kettle’s Grind Pale Ale. It pours an enticing, rich caramel colour and the reason behind the name is obvious as soon as we dip our noses to our Teku glasses - this pale is infused with heady cold brew espresso from Shoreditch roasters Grind. Jim is sold on this one, but Ian Young isn’t so sure. “It’s a bit in between for me. I want more beer, or more coffee - this is stuck somewhere in the middle,” he says. Where Grind fails to deliver for Ian, he’s blown away by Hop Kettle’s next offering. It’s a riff on their rich, 7.7% coffee oatmeal stout, Flapjack, with this version laced with home-made marmalade. And it’s superb. We keep it dark for Hop Kettle’s third and final offering, Evening Star porter. At 5.5%, this one is brewed with smoked Rauch malt for a hint of campfire. Bramling Cross hops bring a kiss of dark berry fruit. Pete Curry is impressed. “I love smoky beers, and you can really taste the smoke in this,” he says. His son, Jack, is just as enthusiastic. “It’s bonfire night - treacle and smoke!” he chips in. But Ian Morton is shaking his head as he tells us it’s the Hop Kettle beer he’s liked the least. Next we move on to a real hop bomb - Fruitpocalypse Now! from Slovenian brewery Lobik. The aroma explodes from the can as Matthew pops the ring-pull. At 6.2% it’s billed as an American Pale Ale, but the appearance and flavour - full murk, insanely fruity hopping and minimal bitterness - are more typical of the New England style. And West coast is exactly what’s up next - sort of. Iconic San Diego stalwarts, Stone, collaborated with three UK high flyers - North Brewing, Magic Rock and Buxton - on their Fellow-Sip IPA, brewed at their Berlin facility for Indy Man Beer Con beer festival. On paper, it should be a slam-dunk hit, but the uneasy shufflings around the table suggest a misfire. Ian Morton tries to get a handle on the aroma, but can’t place it, and our photographer for this evening - Paris - agrees. “The smell is unusual - it’s confusing,” he says. For our final two beers, we push the hops aside and allow yeast to take centre stage. First up, we pop the caps on a couple of bottles of Hefeweizen from emerging Welsh brewery Lucky 7. This one turns out to be a great showcase for just how much yeast, an often-overlooked ingredient, contributes to the flavour and personality of a beer. Matthew pours gently at first and we all take a few sips of the pale, straw-coloured beer in our glasses. The banana and clove profile of the yeast is there in spades, and we all agree there’s a spiky tartness to the beer. Then Matthew swirls the bottles and adds a dose of cloudy, yeasty dregs to our glasses. Finally, a real curveball of a beer, and another where yeast is the star. Kent-based Curious Brew are an offshoot of wine producers Chapel Down, and bring the expertise of their parent company to beer making. Their Chapter Two Elderflower Saison - a collaboration with Brew by Numbers - is fermented on yeast from Bacchus grapes, resulting in a gently vinous beer with a wild, funky streak. On that note of happy confusion, we round up the tasting and drift off to the bar to try some more of Hop Kettle’s offerings. After a pint of their easy-drinking cask pale, Element, I spot their Flapjack Marmalade pouring on keg and decide, as the night draws to an end, that it’s time for one last dessert.